I'm delighted to be a featured artist with the Wake County Library System for the month of September as we explore the beauty of the North Carolina landscape. It would be an honor to have you join me for presentations at two of our local libraries, including live painting demonstrations and the opportunity to ask questions about interpreting the local landscape with pastels. 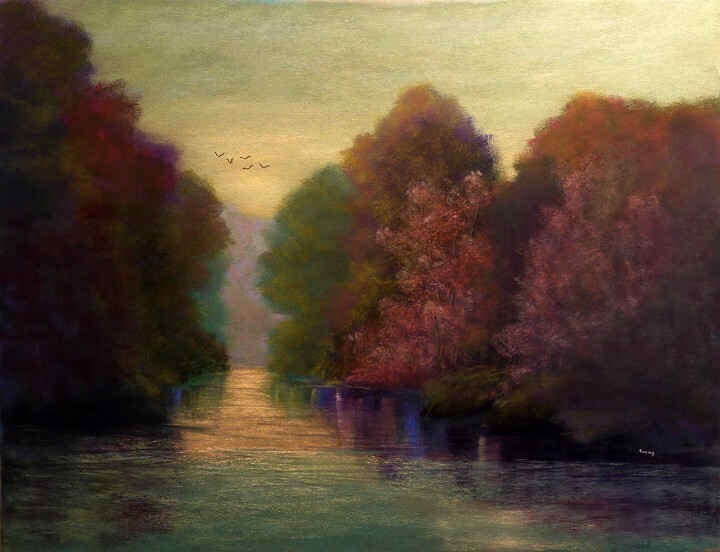 © 2016 Tammy Kaufman - Ethereal Dance - soft pastels on Sennelier La Carte Pastel Card 19.5" x 25.5"
On Monday, September 12, from 11 a.m. until noon, I'll be at the East Regional Library at 946 Steeple Square Court in Knightdale. On Sunday, September 18, from 2 - 3 p.m., I'll be at the new Northeast Regional Library at 14401 Green Elm Lane in Raleigh (Wakefield). As part of this program, I'm honored to have my pastel landscape paintings on exhibit in both these lovely libraries throughout the month of September. © 2016 Tammy Kaufman - Fugue - soft pastels on Sennelier La Carte Pastel Card 9" x 12"
© 2016 Tammy Kaufman - More Than Words Can Tell - soft pastels on Ampersand PastelBord 12" x 16"
Twelve works are in the lobby display cabinet at the Northeast Regional Library in Raleigh (Wakefield), and 12 works are hanging along the main back wall at the East Regional Library in Knightdale. Inspired by the uniquely beautiful North Carolina landscape, these paintings range from 4x6 to 18x24 inches in size, are all framed under glass and wired for easy hanging, and will be offered at special "Meet the Artist" adoption fees between 35 and 425 dollars, with the profits going to animal charities. I look forward to your visit!